National Steel And Agro Industries Ltd.
All it takes is a dash of colour to brighten up everything. Even our sheets. With the dream of making the world a brighter place, National Steel has introduced its flagship brand, KOLORMETAL. Manufactured with equipment from the world leader in colour coatings – Bronx Australia, KOLORMETAL has set a landmark in the Indian steel industry, and even commands credibility in the Global market. Available in a vast array of colours, KOLORMETAL is set to change the way the world looks at steel. PPGI process is a roll coating process which consists mainly of cleaning, pre-treating, primer coating, finish coating and baking. No corners are cut in our endeavour to deliver the best to our customers. From cleaning to baking, every bit of care is taken to eliminate any drop in quality, even while maintaining our delivery timelines. At National Steel we believe that one size or colour doesn’t fit all. In keeping with customer requirements, we manufacture different types of Roofing Sheets in various shapes. The sheets have large coverage and are suitable for several industrial applications. They are created with side lap corrugation which provides crucial support at the point of panel overlap, making them easy to install. To make the process even more seamless, our team of skilled professionals can efficiently install the sheets. Using Butyl tapes, which makes the structure weather proof, the team seals the specially-designed side lap anti-capillary grooves. With quality and innovation as our guiding principle, we always strive to stay a step ahead of industry standards. 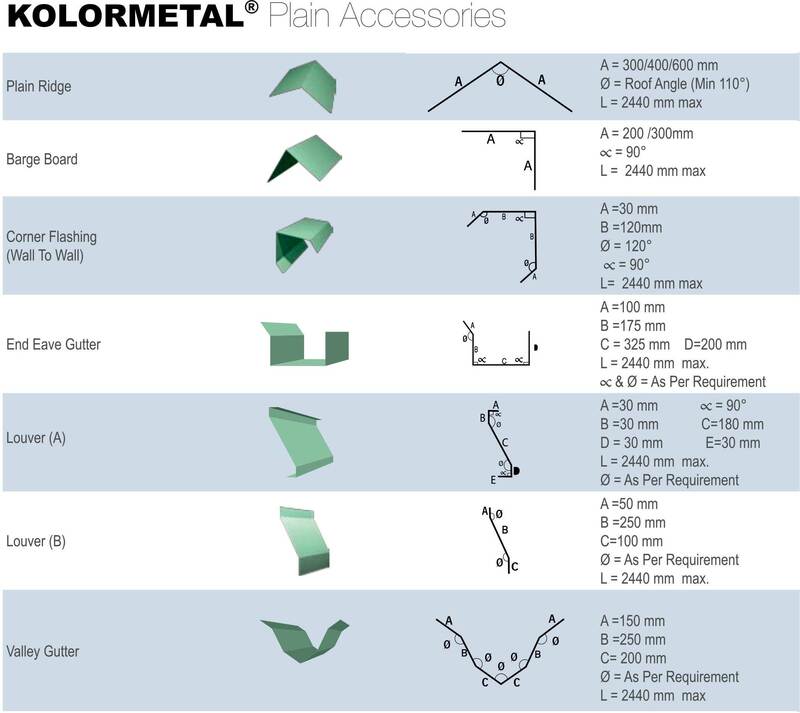 NSAIL’s KOLORMETAL new Profile Sheet boasts of a modern design with guard film and comes in many attractive colours. It is characterized by improved strength, provides better coverage, and is cost effective as well. • Withstands wind velocity of up to 180 km/hr ? A versatile roofing product that straddles elegance, flexibility and strength. The sheets are perfect for any building need. 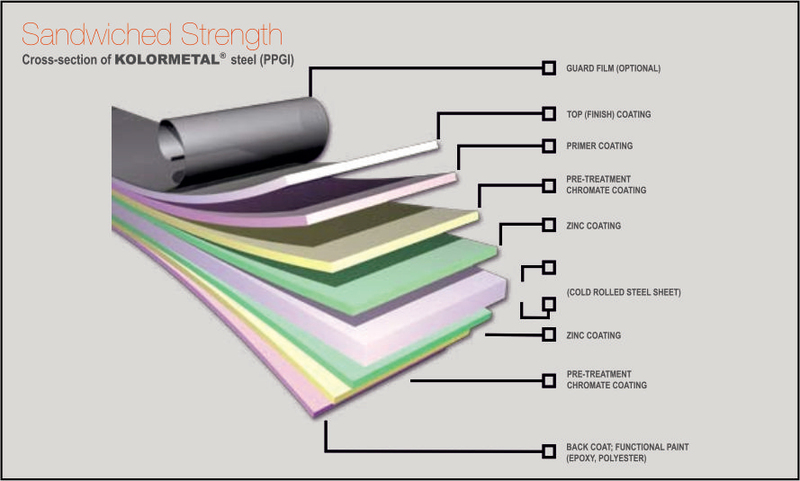 KOLORMETAL® 1000 is specially designed for advanced roofing applications that require high durability and performance. It has an optimal pitch and depth ratio which gives it superior weight bearing capacity. Its distinctive design ensures a watertight roofing solution with the added advantage of having an anti-capillary groove, which keeps the installation leak-proof for a long time. Moreover, the design prevents moisture accumulation on fasteners, thereby averting premature corrosion. Our Galvanized Trapezoidal Roll Formed Metal Decking Sheets are designed for a wide range of applications from industrial to residential roofing and flooring. Our in-house tools and structural design facilities help meet customer demands for technical accuracy, quality & durability. • The Kolor Roof Decking range is available in an array of thicknesses (0.50 mm to 1.00 mm) profiles and multiple finishes to meet different requirements vis-a-vis span, insulation, water proofing, imposed load, and any other special considerations. Faster Project Completion: The use of Metal Decking allows for the construction of multiple floors simultaneously, hence saving considerable project time. Better Strength: When used as permanent shuttering, it provides a strong & safe platform for layering reinforced concrete & also for the labour working on the floor. Saving in Material: When used as a composite floor, it reduces the thickness of both concrete & the reinforcement, which in turn increases floor-to-floor height. Clear Space for Working: It eliminates shuttering & de-shuttering planks, props & provides a clear space for working on the underside of the RCC floors. Improved Functionality: The profiled shape of the metal decking allows nesting of service cables & wires within the notches. Saving in Cost: Use of Metal Deck lowers material handling costs & labour costs since it economizes concrete & steel consumption. • The sheets can reduce echo & noise, a useful feature in airport buildings, auditoriums, concert halls, indoor sports arenas, television news rooms, radio station announcement rooms etc. • Can be used as fencing in gardens, buildings, factories, complexes etc. The crimped sheets are primarily used for curved roofs as these sheets are manufactured from normal trapezoidal profile sheets with required bending as per structural requirements. It ensures uniform long bend sheets which are leak proof. With long and thorough industry experience, NSAIL has the ability to manufacture very high quality assortment of Curving & Crimping Sheets. Exported across the world, they are available in concave and convex shapes with flats and angles customised as per client specifications. These sheets are produced by our experts using high grade raw materials and are supplied in various specifications. Our Colour Coated Corrugated Sheets are built for superior performance and longevity. Designed specifically for roofing where an aesthetic appeal is required, these sheets are produced in a wide range of colours & dimensions with width ranging from 665 mm to 1220 mm in two variants (i.e. Top colour on top side or Back colour on top side as specified by customer). These sheets find use mainly for roofing purposes where the strength or wind velocity load is not a major factor. • Packet Weight: Max. 3.5 MT. Wood Finish, Wrinkle Finish, Camouflage etc. STEEL ON THE INSIDE. FIND OUT WHAT’S ON THE OUTSIDE.